We are proud to announce a new addition to the New York Appleseed Team. Hebh Jamal is a senior at Beacon High School. 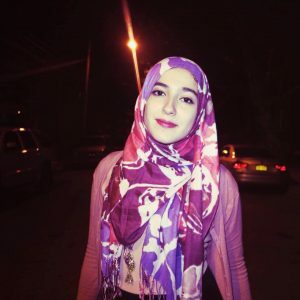 She is a member of Muslim American Society and was featured in the New York Times article, Young Muslim Americans Feeling the Strain of Suspicion. Shortly after, Hebh was invited to speak on a panel with the president of the Ford Foundation on her experiences being a Muslim in a post-9/11 America. The conversation can be found here. Through sincere dedication and curiosity, Hebh became committed to giving back to her community, but more importantly fighting for what she thought was right. Through a simple observation, Hebh managed to question why schools looked the way they did, eventually leading to the conclusion that school segregation affects all New York City students. She joined the organization, IntegrateNYC4Me, and shortly after earned the role of a Lead Student Activist. In the effort to diversify New York City schools, Hebh introduced the idea of having a Diversity Council where students from all districts across New York City can meet and be the leading force for integration. Now, more than fifty students attend the council, along with politicians, teachers, educators, and advocates. Hebh brought people together and as an advocate, she aims to create a sense of community through dialogue and activism. Hebh is excited to work with New York Appleseed and be a contributing force to the team.